Team ups in comics are nothing new. However, the way Michael Uslan does it brings style and guile to a great premise featuring two classic pulp heroes. 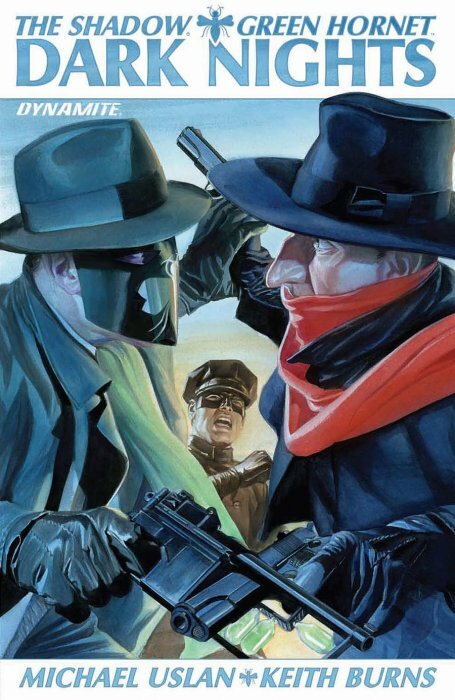 The Shadow and Green Hornet are no strangers to deep-rooted conspiracies and it’s their similar personality that makes them a perfect combination to foil a history altering plot. Speaking of history, actual events tied into the main plot serves the story in dynamic fashion. What might have been weaved with what could have been paints the antagonist, Shiwan Khan, in a treacherous light. As the reader, we know the outcome of events like World War II, but the thought that there was such a potent influence behind it all makes the stakes that much higher. Keith Burns produces some masterful layouts throughout the book. The flair exhibited when an alligator breaks through walls and chews up folks, only for Kato to take it out with some Karate chopping action is a guilty pleasure worth experiencing. Come to think of it, I might make it my screen saver. Dark Knights is a fantastic read that works because of how the adventure unfolds. The volume one in the title of the book makes me up this isn’t the last we’ve seen of this intriguing pairing. WWF Playing Cards are Slamtastic!